Will Hong Kong’s protest art be saved? A woman adds a piece of paper to a wall with a message of support for pro-democracy demonstrations. HONG KONG — For six weeks and counting, residents here have blocked streets and slept on tarmac to push China’s autocratic leaders to allow open, unfettered elections. Their calls for suffrage have been a rare mass plea for freedom within the Communist country’s borders. As they have unfolded, the rallies have produced something else as well: a dazzling display of protest art, with a fervor and scale that would surprise any city. Harcourt Road, an eight-lane highway that slices through the financial district, blooms with paper and fabric. Within hours of the protest’s start, the road’s blue westbound lane signs were masked with a new detour sign pointing to “Peace, Freedom, Democracy (True).” The city’s chief executive, C.Y. Leung, has been depicted on posters as a wolf, as Hitler, and as Mao. The movement’s symbol—the umbrellas clutched by protesters to fend off pepper-spraying police—have multiplied in a dizzying range of forms. Students folded umbrellas in origami miniatures. There are umbrella mobiles and a nylon umbrella canopy. One artist hewed a 12-foot statue from wooden blocks, depicting a man offering shade. A favorite for photo-snapping tourists has been a nearly life-size poster of Chinese President Xi Jinping hoisting a giant yellow parasol. Over the weeks, protesters and visitors have papered a government center wall and staircase with multicolored Post-it notes, turning it into a canvas of scribbled hopes. It was soon nicknamed the Lennon Wall, inspired by a graffiti-ed monument in Prague named for the former Beatle. “You can read the story of the movement in the layers of notes,” said Shuk-ching Lee, a 22-year-old sociology major and one of the founders—she prefers “guardian”—of the wall. 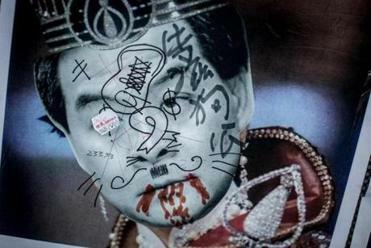 Protest art showing Hong Kong’s chief executive is among the most popular. 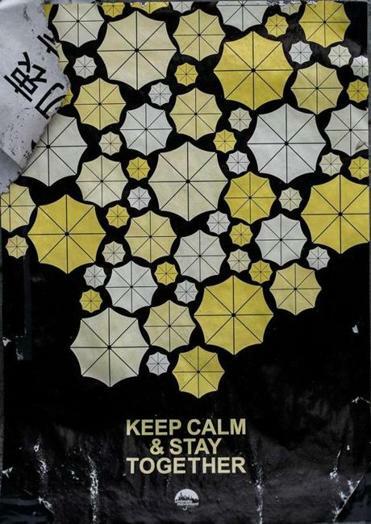 A poster made by pro-democracy demonstrators at the main protest site in the Admiralty district of Hong Kong. As the protests drag on, it is becoming clear that the art of the Umbrella Movement is a legacy worth preserving in itself. Some of the pieces are aesthetically stunning; some are simply very clever. More importantly, artists and scholars say, the sum of the posters, sculpture, and objects—like body armor made of plastic bottles to ward off police batons—defines a historical moment. Together, they paint a portrait of a generation brave and crazy enough to fight a Communist regime. It’s also clear that, unless something is done, much of the art may be lost. Numerous court orders are demanding that strikers leave public throughways—which would likely mean that the art would be cleared and trashed. On Oct. 17, Hong Kong police swept through one of three protest sites, razing barricades, ripping down banners and signs, and destroying a shrine to Guan Gong, the mighty Chinese deity. Recent rainstorms washed away many of the Lennon Wall notes. Several cloth banners, including one tribute to George Orwell’s dystopian vision (“All Animals Are Equal…” ) hang twisted and faded. In response, protesters and artists have rallied to preserve not just the objects, but the environment they inhabit. Wen Yau, a performance artist, and artist Sampson Wong have organized a group called the Umbrella Movement Visual Archives & Research Collective, which has deployed 10 teams of people to photograph and interview protesters. They envision a future online site that would show protest objects, their location and meaning, and include thoughts from the creators. Another team, led by Kacey Kwok-choi Wong, an assistant design professor, mapped out the location of art pieces, and has enlisted volunteers to grab certain artworks and, should the police arrive, hustle the art to trucks. The group has lined up storage at more than a dozen galleries. Their goal, in part, is to preserve ephemeral-seeming protest art for future generations, a trend among Western museums. A growing number of exhibits, especially in Europe, have displayed activist art, said Gavin Grindon, cocurator of the current exhibit Disobedient Objects at the Victoria and Albert Museum in London. That exhibit, featuring homemade shields and gas masks, seeks to celebrate the creativity inspired by political activism. It’s not the only one; in 2006, Harvard University’s Fogg Museum pulled together examples of protest art from Renaissance woodcuts to ’60s T-shirts to contemporary prints invoking Iraq’s Abu Ghraib prison scandal. 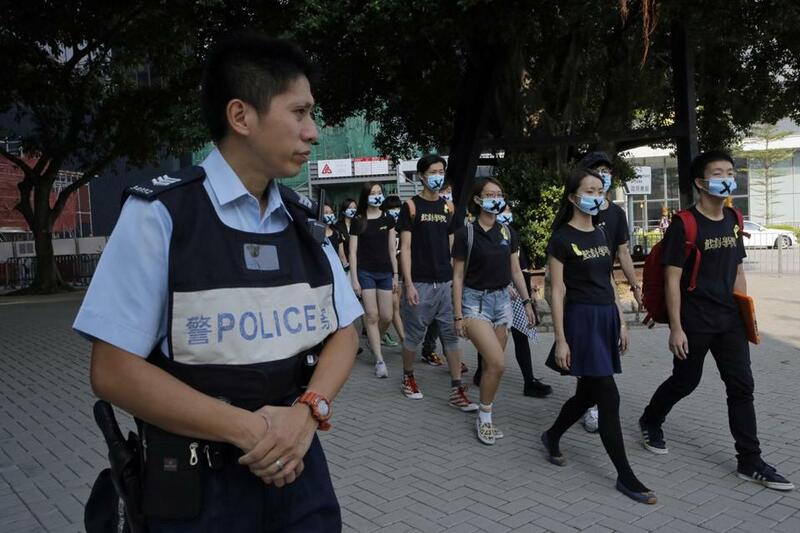 Students of the Hong Kong Academy for Performing Arts during a “silence parade” near the government headquarters. It’s conceivable that some Umbrella objects could wind up in such collections or museums. One place unlikely to host such a show, however, is Hong Kong itself. Most big cultural events here are sponsored or financed by the government; most dollars flow from the government’s Arts Development Council, which tends to fund established groups—orchestras, Cantonese opera, the ballet. The Hong Kong government, arts specialists say, won’t want to help preserve art that skewers the chief executive and the city’s leadership. Kacey Wong’s group has been trying to convince museums in the city to house and perhaps display the work, said Meaghan McGurgan, one volunteer. So far, however, they have not found a willing institution. Another obstacle to preserving the Umbrella movement art comes from within the Hong Kong art world itself. Several local artists and curators have balked at moving protest symbols to guarantee their survival; doing so, they say, would artificially alter the objects, robbing the artwork of meaning, and destroy some of the inspiration that fires the people camping outside all these weeks. “Right now it belongs to the street and no one should touch it,” says Kacey Wong, who says he has urged protesters keep the art in place until the protest ends. 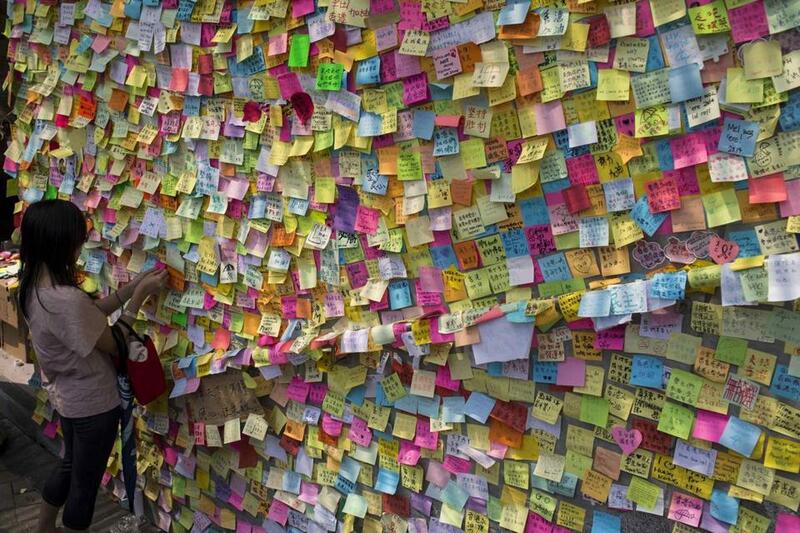 Lee, who wanted to remove some of the Lennon Wall Post-it notes for safekeeping, was told to leave things be. Instead, she and some volunteers have coated a wall section with large laminate sheets to protect them. She plans, if police arrive, to rip down the sheets and run. Better, she says, to make sure some of the notes are saved than none at all. In the end, the collective message of the signs and sculptures—a cry for universal suffrage—may best survive through the words and memories of the protesters themselves, even if the tangible objects disappear. Suzanne Sataline is a writer living in Hong Kong.